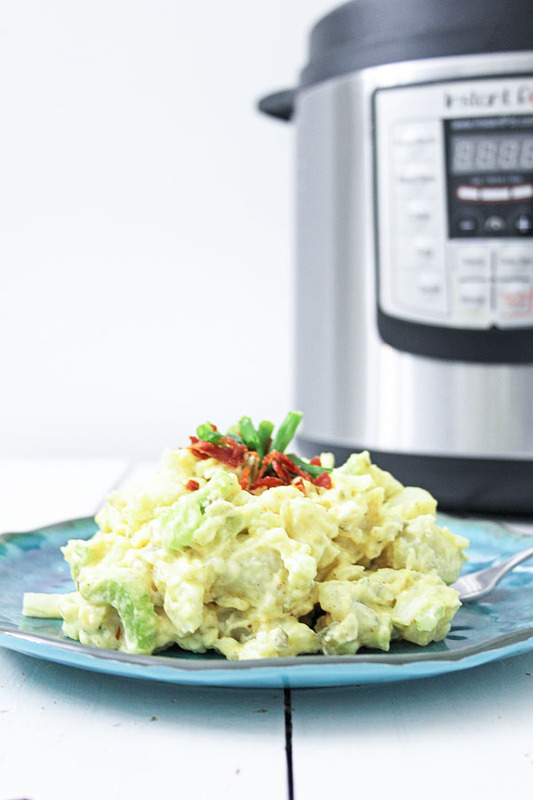 Instant Pot Potato Salad will be on your holiday (and summer) menu regularly! 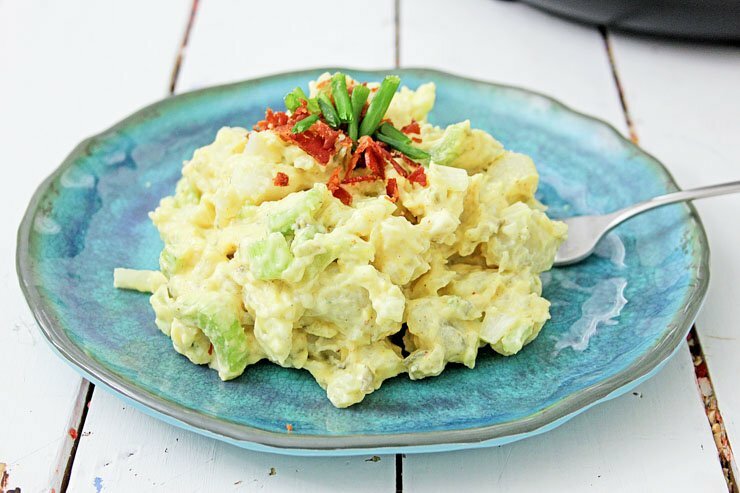 Such a great short-cut to homemade potato salad! Potato Salad is a staple side dish around here! I don’t know if it’s just because it feeds a crowd, but potato salad is just something that MUST be at every cookout, church meal, and spring/summer holiday. Now that I am cooking for those big dinners myself (rather than just eating LOL) I have always wanted a short cut to potato salad. It’s not the quickest side dish to whip up. And if you mess up one thing, even slightly, it can really change the flavor. So, I tried this recipe in the Instant Pot! 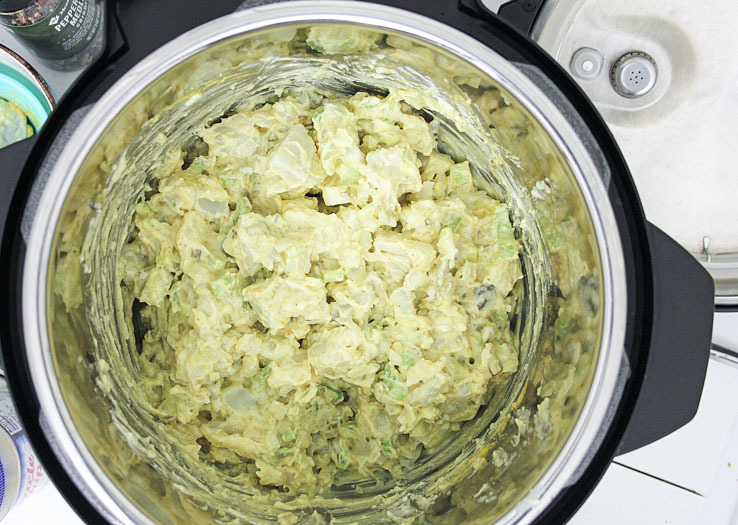 The potato salad is a two step process, even in the Instant Pot. First, you peel your potatoes and insert them into the pot (use steamer basket or trivet if desired). You will also cook your eggs at this time, so they go in right along with the potatoes! Set them gently on top of the potatoes. Again, a steamer basket keeps things from potentially moving around but is not necessary for this recipe. Seal and set to Manual for 4 minutes. After the potatoes and eggs are cooked, remove eggs and peel. Now is a good time to pour off any excess water that has accumulated in the Instant Pot. Add “boiled” eggs back into your Instant Pot. I diced the eggs a bit and also mushed up the potatoes to the consistency I wanted. Then covered lightly and put the pot into the fridge to chill. After the potatoes and eggs have chilled, I added Mayonnaise, onion, celery, relish, both mustard’s, Mayonnaise (you can use Miracle Whip), garlic salt, and seasoned pepper. 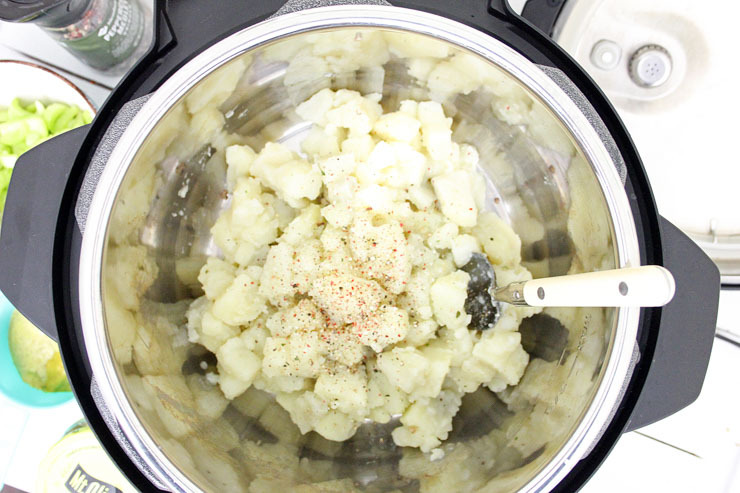 Mix well without overly mushing potatoes. I always taste and check to see if it needs more salt. Finally, remove and put it in your favorite serving bowl, cover and chill in fridge until it’s time to eat! Enjoy! This recipe gives an old favorite a new twist, using a new method, and ingredients that are flavorful, mouthwatering and really delicious. This will be your go to recipe for a great side dish for barbecues or casual get-together's. If you do not have a steamer basket, carefully set potatoes on top of trivet, or in the water. If you're using eggs, rinse the eggs in cold water, and pat dry with a paper towel, and place them right on top of the Potatoes. 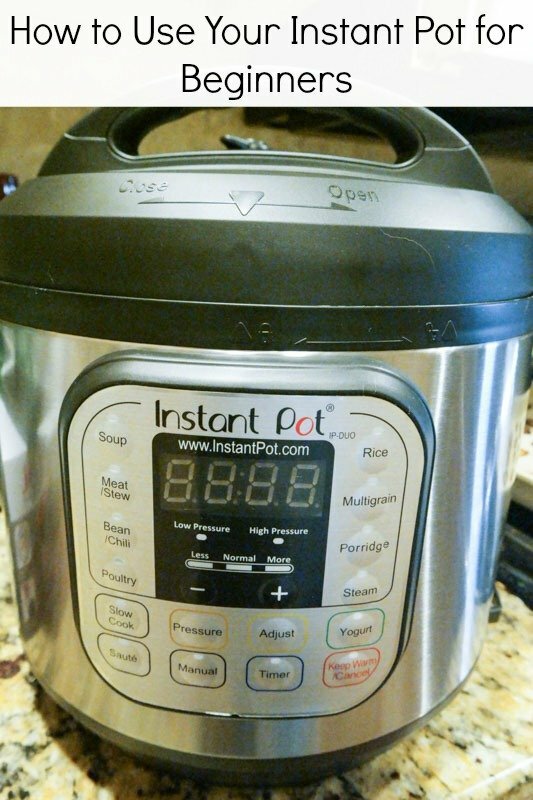 Place the lid on the Instant Pot until it beeps and locks. Make sure the pressure valve is set to 'SEALING' and press the MANUAL button, and set the time to 4 minutes. When the Instant Pot is done, and goes to 'OFF' wait 1 minute, and with an oven mitt, carefully turn the pressure valve to venting and release the pressure. Place eggs in a bowl of cold water for 5 minutes to stop the cooking. Place the Pot in the refrigerator for about 15 minutes or until potatoes and eggs are cooled. Once all ingredients have been mixed together, place potato salad in the refrigerator and chill for at least one hour. Once the Potato Salad is chilled, place in a serving dish, top with crumbled bacon and chopped chives, and serve immediately, or cover and place in refrigerator until ready to serve. Want to submit a recipe to be featured? Here are some tips on how to get featured. Try to use good lighting, we know it won’t be perfect but taking your photo out side on a solid back drop helps. Wood looks amazing by the way. Using a solid white plate can help your recipe pop. Take several different shots. Including a few step by step photos or one of all the ingredients together or even if you are doing a dessert such a cheesecake trying also taking a photo of a slice by itself. 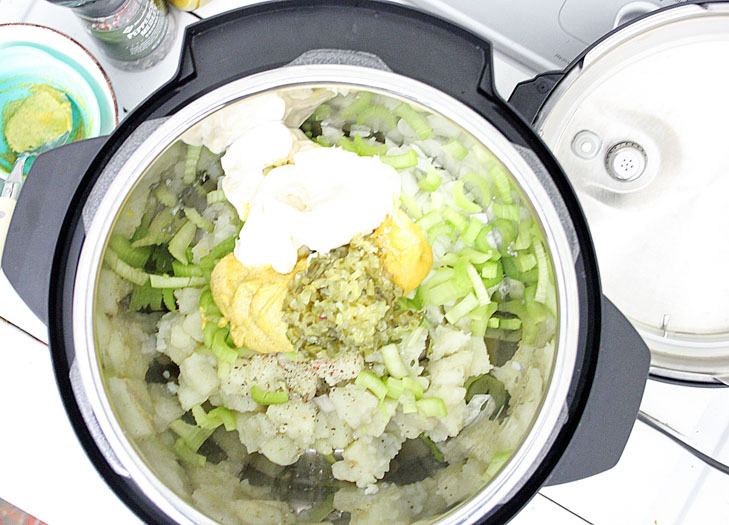 Check out our post on How to Your Instant Pot for Beginners. 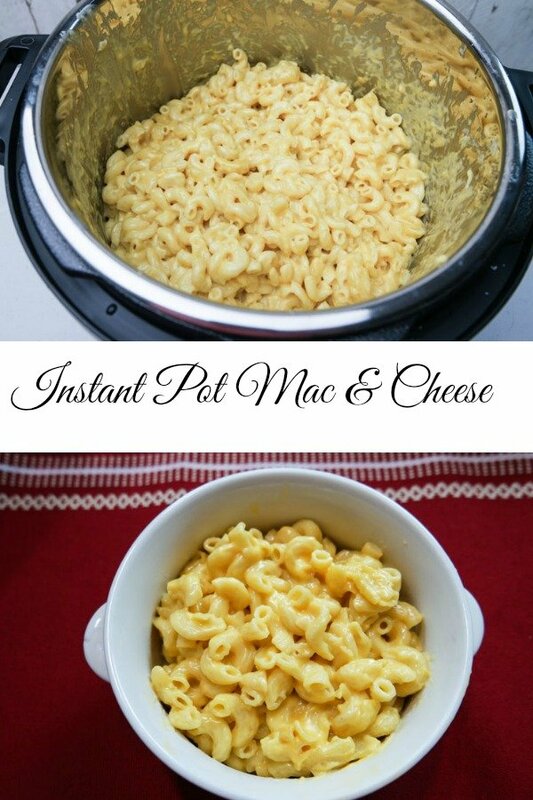 How to make Instant Pot Mac and Cheese so easy and delicious. This Instant Pot Spaghetti and Meatballs Recipe is so easy to make with hardly any clean up, that you will never want to make it on the stove top again. I am excited to share this new Instant Pot Recipe! 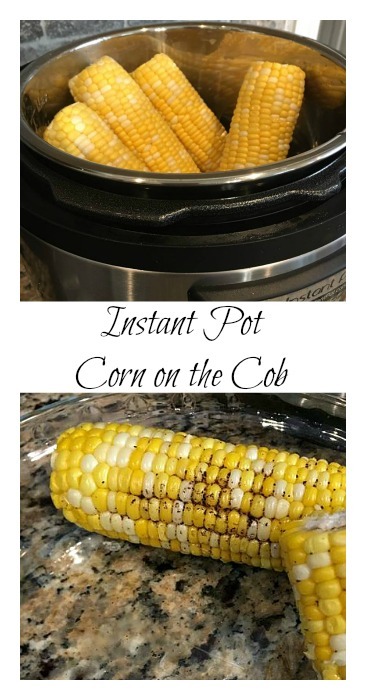 If you love corn on the cob but aren’t crazy about heating up the kitchen to boil it on the stove, this Instant Pot Corn on the Cob recipe is for you! One of My Favorites is No Lard Instant Pot Refried Beans. I’ll never buy canned beans again. 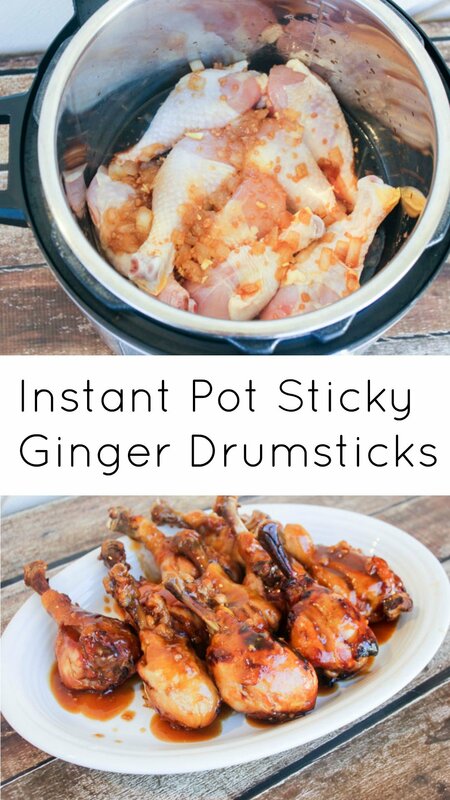 How to Cook Yummy Ginger Drumsticks in Your Instant pot. 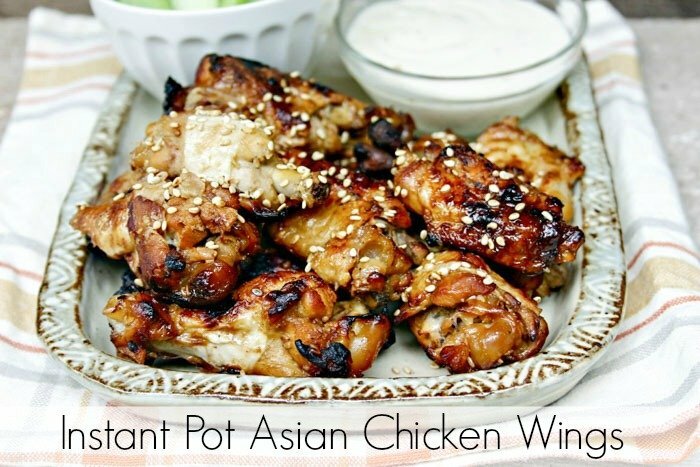 These Instant Pot Asian Chicken Wings are the Perfect Weeknight Meal.